Reconstructed jaws of Carcharocles megalodon by the American Museum of Natural History, New York. 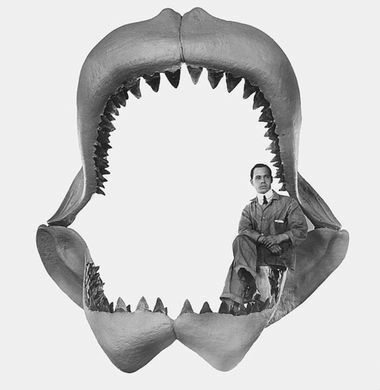 This 1927 reconstruction is now thought to be about 30% too big, based on what we know about the teeth, but gives a good idea of the monstrous size of this shark. We’ve had giant apes (King Kong), giant lizards (Godzilla) and even giant spiders (Tarantula) and now we have giant sharks to add to that list with the release of The Meg. Unlike those aforementioned cinematic beasts, this beauty was real and was the oceans’ apex predator until it went extinct some 2. 6 million years ago. Doug McClure got off lightly! So, what do we know about this prehistoric beast? The Megalodon (Carcharodon megalodon) quite literally means big tooth, and at over 7 inches long (and almost 300 of them) they are probably big enough for Matt ‘butter fingers’ Hooper to not drop them. Obviously we’d never upset it by saying it had a big gob...this one really would swallow you whole. The Megalodon has a blink and you’ll miss it cameo appearance in #Jaws when Chief Brody is flicking through shark books, it’s that iconic image we all know and love of two rows of Victorian men stood in its jaws. That’s both Scheider and Statham on its CV, not a bad record for this vicinity. Megs are estimated to have grown up to between 60 and 70 feet in length. You really are gonna need a bigger boat to face up to this prehistoric fish, you’ll just need plenty of room for all those yellow barrels. Contrary to popular belief, the Great White and The Meg are not closely related. A giant shark - the largest that ever lived - had an appetite to match and its estimated it had to crunch its way through a ton of food each day - which is certainly more than a freezer full of holiday roasts. That ‘hot lunch’ would include the likes of whales, sea cows and sea lions. Where could you find the Meg? Pretty much any where in the world where the sea was the correct temperature and the food was there to sustain it. So you could have expected to see the huge dorsal fine of the Megalodon slicing through the waters of both North and South America, Africa, Australia, Europe, India and the Bahamas...watch out Hoagie! A Meg tooth was even found just last month (July 2018) in Clacton in Essex, in the East of England. It was found on the shoreline of a local beach. Who knows perhaps they’ll film a Meg sequel there? So what killed it off as a species? It certainly wasn’t Caveman Brody and a giant oxygen tank, instead it is estimated that it was a mix of climate change, which impacted on both sea levels and the food that the Megalodon ate to survive. If it wasn’t there, then neither could the largest shark that ever lived...or could it? The Discovery Channel got into huge controversy a couple of years back during one of their Shark Week ‘documentaries’ that purported to show that this huge beast still existed, it was of course a fake documentary - and was trailed as such - but was convincing enough to be seen as misleading. Obviously the same people who thought Ghostwatch was real. Science tells us that Megalodon is extinct. To paraphrase Matt Hooper, it probably is Martin, it probably is, but then science also told us that Coelacanths had been extinct since the Cretaceous period - cue said fish being caught and spotted several times in the 20th century. And then there is the Megamouth shark, which was only discovered in 1976 - clearly wanting to maximise its publicity post the release of Jaws the year before.